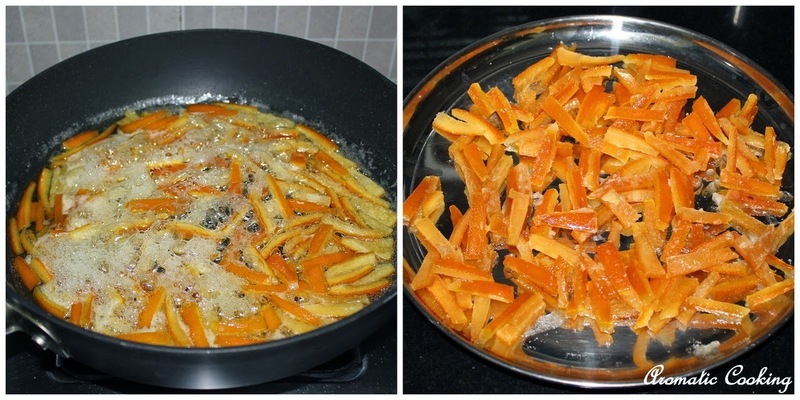 For last month's Eggless Baking Challenge we had to do Norwegian Christmas Bread and I needed candied orange peels. I couldn't find them in the nearby stores, so finally made my own at home. Though it takes more than an hour to make this, the method is actually pretty simple. 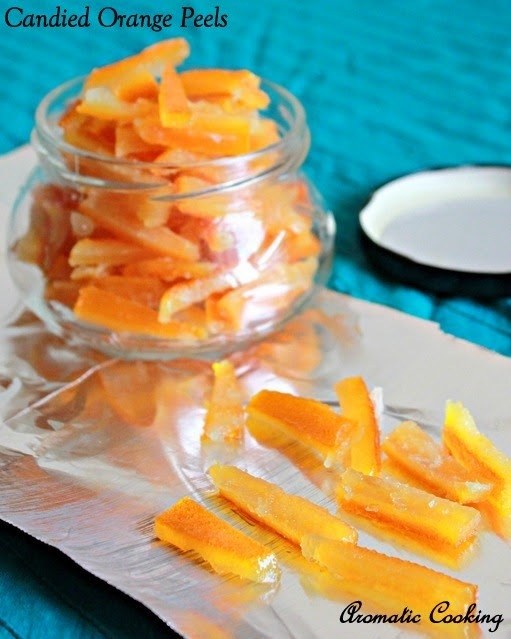 At the end, I had more than 2 cups of candied orange peels, it can be refrigerated and used in various breads and cakes..
Peel the oranges and slice the peels into about 2" pieces, as shown in the picture. 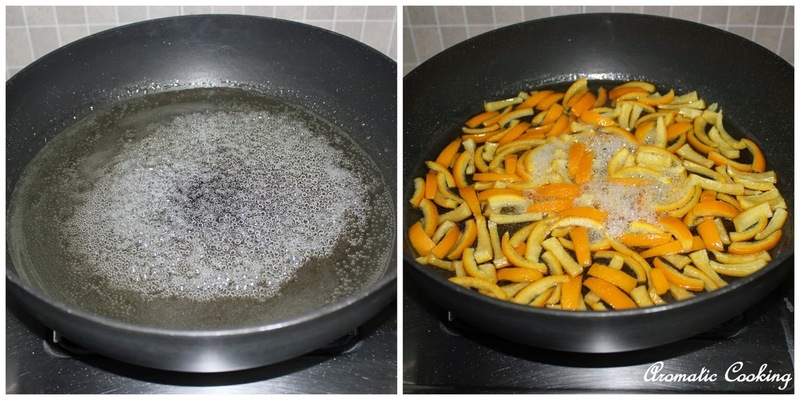 Boil the orange rinds in some water and simmer for 5 minutes. Drain and keep. Mix the sugar with 3/4 cups water, heat it and simmer for 8 to 10 minutes. Then add the orange peels and simmer for another 45 to 60 minutes. Drain, spread it on a plate and air dry it for at least 2 to 3 hours. Separate the pieces and refrigerate them for future use. I left the drained orange peels in the fridge and let it cool and dry, it came out good. Don't stir the sugar syrup, if needed, just swirl the pan once or twice. Use oranges, the ones we use for making orange juice. Homemade tastes so much fresher and better! This looks super, Hema. Very nice... Homemade is always the best.. They look so nice! I haven't tried this before. But now I am thinking of. Thanks to your post. 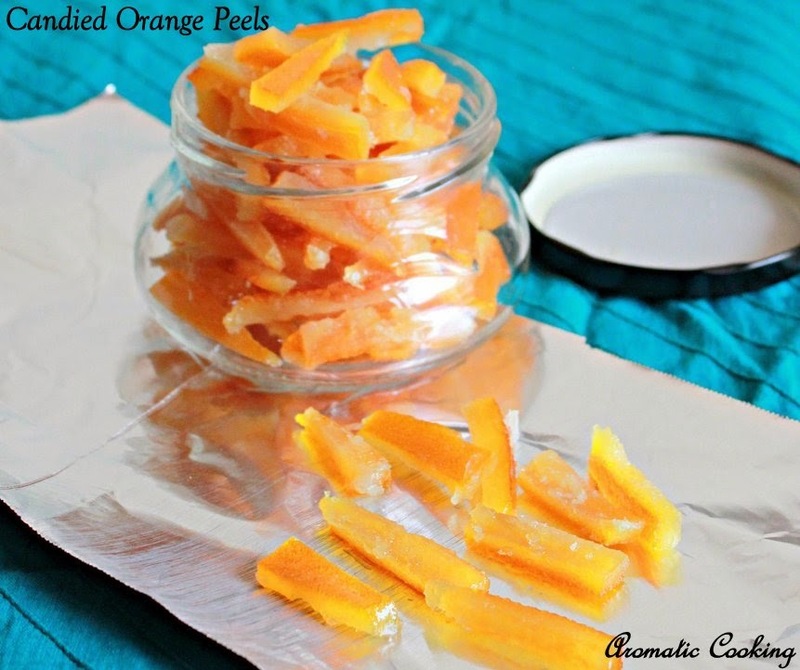 Well done, better to make these candied orange peels at home, personally i felt that storebought are very expensive. They look so colourful and yum!